An unspoilt wilderness atmosphere can be experienced in the Caprivi Strip, where rugged game-viewing and excellent fishing can be undertaken. It is also a gateway to some of the best game reserves in Botswana, Zambia and Zimbabwe. This area is crossed by two major rivers, the Zambezi River (main photo) with it's Chobe tributary. Further West is the Okavango and Kwando Rivers. These rivers form the boundaries between Namibia, Zambia, Botswana, Angola and even Zimbabwe. 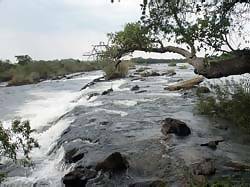 The Caprivi floodplain's are part of an ancient desert which are today lush tropical bushveld and offers more affordable safari holidays then it's neighbours do. From fishing to luxury safari lodges. Some lodges offer pick ups from even Victoria Falls and others excursions to the little known game reserves of Mamili and Mudumu or overnight canoe trips sleeping on sand banks. Mamili National Park (320 km²) on the Kwando river is a winter park, being 80% underwater during the summer rains. Buffalo and elephant herds are good. 4x4 only. Mahangu Game Reserve (245 km²) is en route to the Okavango delta from Divundu. It seldom disappoints and is also a good birding spot. It's also accessible in 2 wheel drive vehicles and the main road to Botswana passes through it. Bwabwata - formerly Caprivi Game Reserve This 32km-wide caprivi park of 5 715km² extends for about 180 km from the Okavango River to the Kwando River. The main road goes straight through it and it is wiser to keep to the speed limit as elephants and game do cross unexpectedly. There are a number of camping sites and lodges (mainly near both rivers). This broad-leafed woodland is more of a game management area as the villagers who have lived here for the past thousand years still do. Buffalo Park section just before the Kavango river is the best place to view game. Elephants move between Namibia, Angola, Botswana, Zambia and Zimbabwe in large numbers. In the dry season they stay close to the rivers. Katima Mulilo is the major centre in the Caprivi Region. The area is highly populated with scattered settlements of subsistence farmers cultivating Mahangu and other crops, tending their cattle, or living off fresh water fish.